B. D. & O. A. W., of Ohio—We can only judge from the outward appearance of the sample yousent respecting the sizing used, and cannot give positive advice. We believe, however, it contains a imall portion of alum dissolved in common size. J. C , of N. J.—Your mode of condensing is new to us, and so far as we know, is patentable j butare you sure about the low amount of power required to feed the boiler ; you will have to move the whole volume of water in the coiled pipe every stroke against the pressure in the boiler. W. W. B., of Wis.—A breeze of 3'S5 miles per hour, exerts a pressure of 33 oz. on a square foot j a gale of 32 miles per hour exerts a pressure of 5 lbs on a square foot ; a high wind of 16 miles per hour exerts a pressure of 1 lb. on a square foot; these pressures have been discovered by experiment : you can calculate the amount of canvas spread. W. J. C, of ?. Y.—The locomotive was found to be uninjured ; the mistake was in the 7 instead of 1 : the resistance to the direct descent of the engine by gravitation by the cars, on the line, must be considerable, but how much we do not know; nor is it of much consequence respecting the particular case. B, F. C, of Boston—We are obliged to defer the publication of your invention until next week. B. F. H., of 111,—Your drawings and specification came duly to hand covering $40. As soon as your model arrives we will examine your invention and advise you of the result. F. R. B., of N. ?.-We have been told that P. Y. was no t correctly represented, and a discussion might not do him justice ; you are correct in your conclusions respecting the chemical action, by which al-chohol is produced, and its fitness or unfitness for use can only be determined by its effects L. B., of N. C.—Multiply the number of inches, area of the piston, by the pressure on the square inch, that by the velocity in feet per minute, and divide by 33,000 for the nominal horse-power : take off one-fourth for friction ; we give you the rule, work it out yourself J. A. G-., of Ohio—Tho clothing used by circus performers is made of silk, wool, and cotton ; the finest of silk, or silk and wool mixed ; india rubber is not used, as it is entirely unfit for the purpose from its vory nature. M. K., of ?. 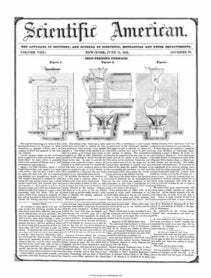 Y.—We have carefully examined your apparatus, and although we cannot say it would not work, yet we believe it would be more expensive to employ electro-magnetism than for the company to build a steam engine upon the spot ; we perceive no advantage gained. G. J., of K. Springfield, O.—The ball you speak of would certainly go through the earth if nothing prevented it ; the difficulty is in getting a hole through. The lenses you wish maybe obtained of Daniel Pike, 166 Broadway, ?. Y. F. P. C, of S. C.—If there is any advantage in the peculiar form of propeller described in your letter a patent could be sustained on it ; to ascertain this point satisfactorily, a practical application will be necessary ; this is all we can say in regard to it. J. H., of Ind.—Address your inquiries to Messrs. Phelps & Kingman, 118 Chatham st, ?. Y. ; they are large furniture dealers. D.D.,ofIll.—Yonr device for raising dirt from pits is not patentable ; it is a very slight modification of the common hoisting apparatus, and posess-es no advantage over it. L. G., of ?. Y.—It is quite common to find wagon wheels made according to your plan ; E. S. Scripture has a patent for it, therefore there is no chance for you to make a claim. N, R M., of N. Y.—A saw mitl can be made, using the friction of two roflers or wheels instead of befts to communicate power or gear up motion, in some cases they are preferable to belts, but not generally. Iron covered with leather is best ; they can be seen in use in this city, but not for saw mills. L. W. Cady, of Baton Rouge, La.—Wishes to know where t; bale rope 11 machinery is made, price of the same, &c. 0. ? , of Ohio—We do not think there is any chance for a patent on the bedstead ; the application of an eliptic spring to this purpose is not patentable, the claim to a combination not being legitimate. W. II. S., of Miss.—We believe Messrs. Bogardus & LXoppin, of this city can furnish you with the articles you want. F. L., of Ct—We do not see any chance for a patent on your alleged improvement in railroad chairs, we have seen the same thing essentially before. J. ? , of Ct.—We do not perceive any thing worthy of a patent in your substitute for the brake ; it could not be anymore effective. Money received on account of Patent Oflice business for the week ending Saturday, June 4 :— J B. G., of Mass., $25 . W. ?. & ? , of 111, $55 ; A. W. L R,, of S. ? , $55; S. & G., of Ct., $30; W. F. T., of ?. Y., $30; B. C, of Pa., $70 ; 0. F. B., of R' I. $30 ; R S ? , of ?. 0 , $32; L. ?. F., of Ga., $25 ;' G. N S., of N. Y., $30; H. M., of N. Y., $268 54 cts ; D. ? , of Pa , $25 , W. C, of Ga , $7 ; ?. F. II . of 111 , $40 ; J. T. D , of ?. Y , $S0 ; W. P. C. & Co., of Pa., $63 60cts ; W. W. H , of Pa., $25 ; J. S. U.' of N. Y., $10. Specifications and drawings belonging to parties with the following initials have been forwarded to the Patent Office during the week ending Saturday June 4:— J. ?. G, of Mass. ; J. S. U., of N. Y. ; D. Z., of Pa.; R. S T., of N. C; W. C, of Ga.